Membership programs are an increasingly popular and fruitful way for organizations, both nonprofit and for-profit, to increase their revenue. They encourage a consistent and stable income stream from supporters and often result in continuous community support and higher community engagement levels. With a membership program, nonprofit organizations usually extend additional engagement opportunities and benefits to their members in exchange for donations in the form of membership fees. Nonprofits of all kinds, from churches and sports clubs to large development organizations, use the membership model to ensure sustained earnings — which ultimately helps with financial planning. There are different ways to go about setting up a membership model, but the most common one has donors paying their membership fees annually. Many nonprofit organizations also choose to set several different membership levels, letting their members choose one that works for them, making their membership models more inclusive. Membership fees are an integral aspect of membership programs, so selecting the right price for membership fees or membership levels is vital. To determine the appropriate amount for your membership fee, you’ll first need to consider the goal of your membership program, the average donation amount of various donors segments, as well as the perks you’re able to offer to your members at different membership levels. For example, Spark offers three membership levels: Member (at $100/year), Supporter (at $250/year), and Sustainer (at $500/year). Yimby offers membership levels ranging from $100/year to $10,000/year. 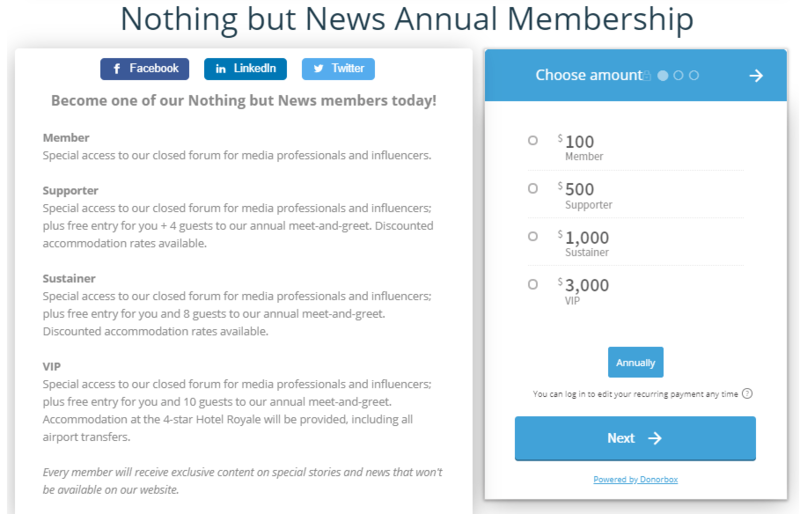 Each of these membership levels offers different benefits and engagement opportunities in exchange. To get your membership program started, you’ll need an annual membership form. 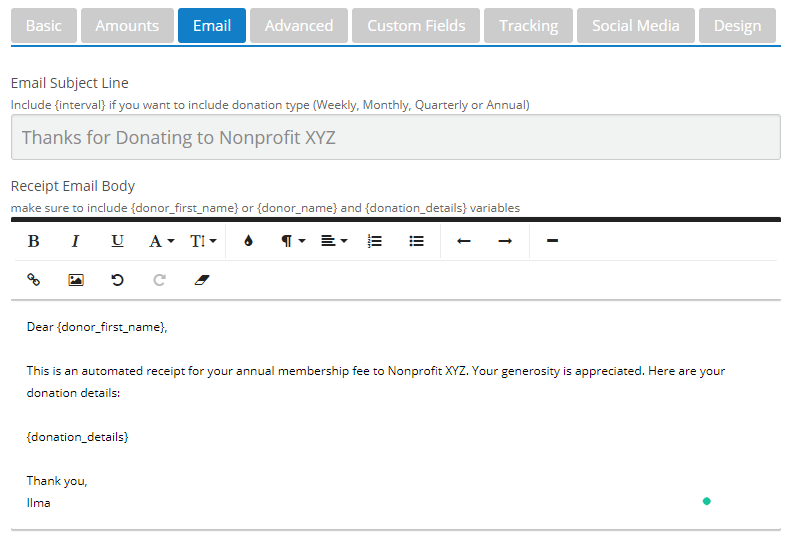 How to create an annual membership form with Donorbox? An annual membership form is essential for running a successful membership program. 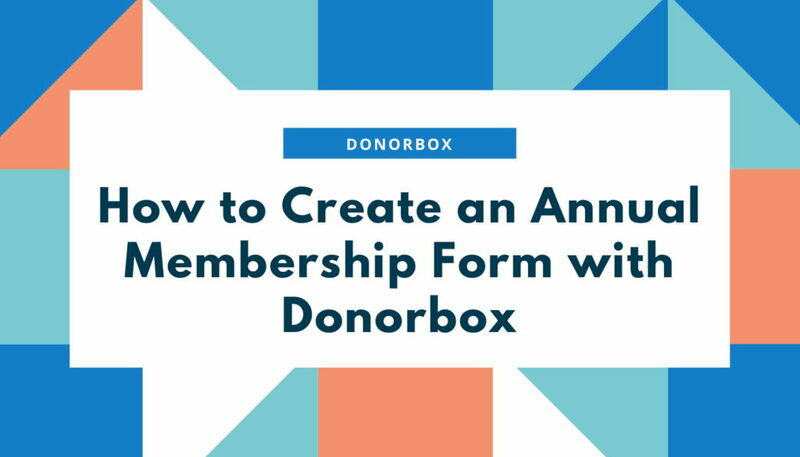 With Donorbox, you can create your own annual membership forms — and customize the branding, form fields, and page content. Donorbox makes the giving process straightforward – encouraging more people to engage in the membership program. To start creating your annual membership form, simply log into your dashboard and click “New Campaign” or the “Edit Form” links for your campaign form. 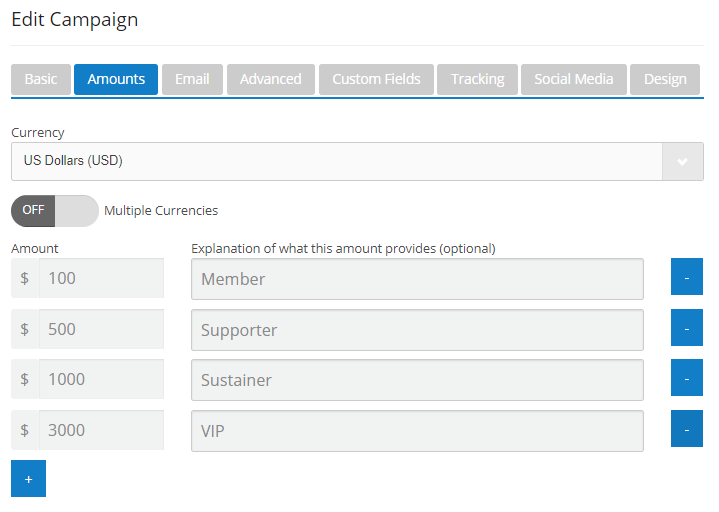 Click on “Amounts” and set donation amounts that correspond to your membership levels. Adding descriptions is optional, but encouraged. Click on “Email”. Change the donation receipt email to make it specific to a membership fee payment as opposed to a general donation. Go to the Advanced tab of the form builder. 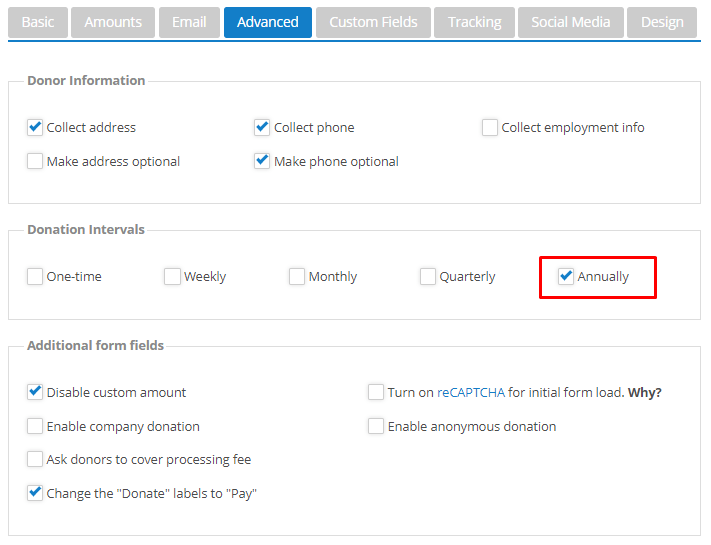 All the available donation intervals and additional form fields will be shown. Check the “Annually” donation interval and uncheck other donation intervals (e.g. weekly or monthly). Check the “Disable custom amount form field”, and (optionally) check the “Change the Donate Labels to Pay”. Also, check any donors’ information boxes you wish to collect. At this stage, your communications with your donors shouldn’t stop. A good nonprofit membership program should constantly see an increase in membership renewal and upgrades to higher membership levels. Approach the membership program marketing strategically and methodically. Make sure you provide valuable engagement opportunities and enticing benefits that will inspire your donors to join the membership program. Focus on maintaining and improving the quality of your membership program. The quality of your service will be crucial for member attraction and retention. Keep communication lines open with regular e-newsletters, invitations to membership appreciation events, and progress updates. In the next blog post, we will share practical tips and best practices for developing a successful membership program. Stay tuned!